An online change.org petition has garnered the attention of nearly 500 students in an effort to change the dorms guest policies. 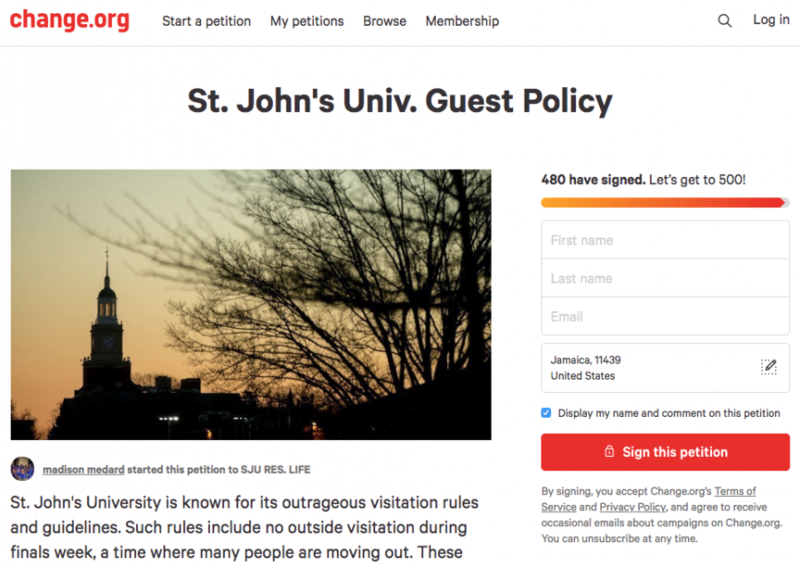 A change.org petition regarding the visitation rules and guidelines for dorm dwellers has been circling social media for one week, calling for more lenient procedures. As of Tuesday, April 2 at 8 p.m., the petition has 480 signatures from purported members of the St. John’s community. 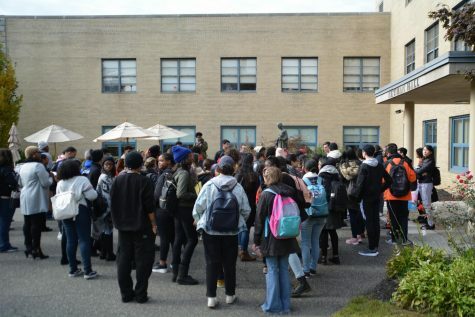 The petition brings up the topics of outside visitation hours during finals week, no entry into other residence buildings after 2 a.m. and the 11 p.m. cut off time to register an overnight SJU guest. 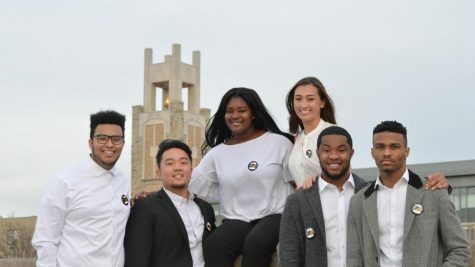 According to the Residence Life Handbook, visitation hours for St. John’s students are 7 a.m.–3 a.m. seven days a week and for non-St. John’s individuals 7 a.m.–midnight. Hours differ during University breaks and finals weeks. The rules follow as: Hosts are allowed up to two daytime visitors, St. John’s students must be signed in by 2 a.m. and non-University individuals must be signed in by 11 p.m.
For overnight guests, all SJU overnight guests must be registered with the Office of Public Safety by 11 p.m. on the night the guest wishes to stay. All non-SJU guests must be registered with the Office of Public Safety by 9 p.m. on the night the guest wishes to stay. Non-St.John’s guests will receive an overnight guest pass which must be retrieved from Public Safety by the host and guest together, no later than 11 p.m. The host will be charged $20 for any lost overnight guest pass. “Students should have a safe and reliable transportation provided by the college to assist their students back to their dorms. 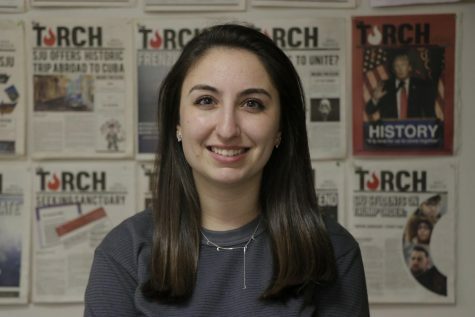 We as parents pay far too much in tuition to not have this service provided for our children,” Jacqueline AminSmith said in the petition’s comments. “The policy needs to be changed,” Maniya Smith said in the comments. The petition concludes that the rules are affecting students’ choices as to whether they will live on campus again another year. 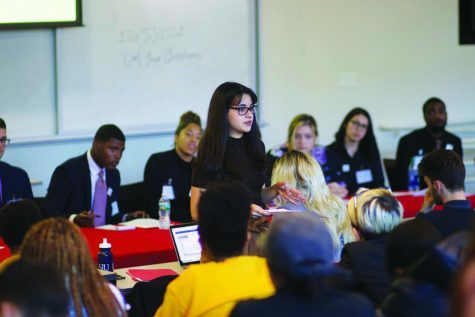 “These problems are causing 100s of students from different classes, to move off campus every semester, struggling to find homes at ages 17, 18 and 19 and putting pressure on their parents, and friends, because of the hefty fines, and sanctions,” it says. The petition can be found at www.change.org/p/sju-res-life-st-john-s-univ-guest-policy and the full residence life handbook can be found at www.stjohns.edu/life-st-johns/residence-life/residence-life-handbook.